The rockumentary, "The Decline of Western Civilization Part II: The Metal Years" was a great time capsule for what the late 80's hair metal scene was all about...it captured priceless moments like Chris Holmes from W.A.S.P. drinking Vodka straight from the bottle while he was on an inflatable object, in a pool, & his Mom was setting there as he grabbed about his crazy lifestyle; I always felt like the 2 brightest moments in the film though were the scenes with Megadeth & Lizzy Borden. Megadeth went on to have a great amount of success & they remained one of the "Big Four" for their entire career, while the latter, Lizzy Borden, had minor success in his heyday, & a large part of that was simply do to lack of promotion, over-saturation of the scene, & to be honest with you, it's a damn shame because Lizzy Borden; the band & the man, are interesting, creative, talented entities & in 2010, believe it or not, Lizzy Borden is still out there shocking & rocking crowds all around the world! Rock N Roll Experience: How did you make your hair so big back in the 80's because you look so difference these days. Lizzy Borden: A Blow dryer...I blew it, no conditioner, no nothing & it just got crazier & crazier & crazier until it just fried completely, I remember being in Japan & it just fried so bad that it was like, Ok, I've got to stop this! (laughs) so I just stopped doing it & I started using conditioner (laughs). After a while my hair was just tumble weeds. Lizzy Borden played Baltimore, Maryland on May 22, 2010 & thanks to my buddy Brian @ Baltimore Sound Management, I had the opportunity to sit down with Lizzy prior to his set & ask him a hand full o' questions, so I'll mix my q & a with Lizzy in with my review of the show. Formed in 1983, Lizzy Borden is named after the notorious Lizzie Borden, a woman accused and acquitted of murder in the late 19th century...there's a popular children's rhyme about her that goes, "Lizzie Borden took an axe & have her father 40 whacks; when she saw what she had done she gave her mother 41!" The story behind Lizzie Borden was that she supposedly chopped her parents up with an axe in a gruesome murder...there was a movie starring Elizabeth Montgomery (Bewitched) that told the entire story, but Lizzie was never found guilty in real life although the evidence was overwhelming. Even though I don't need to mention it, this is also how shock rocker Alice Cooper got his stage name...there was a witch named Alice Cooper & that's where Vincent aka Alice lifted his namesake from. Rock N Roll Experience: Does it piss you off that someone like Marilyn Manson achieved more success than you did, because in theory, what you do/did is the same thing almost. Lizzy Borden: We were on an independent label, so we didn't even have any of the promotion that bands have on a major label, so I knew that we weren't going to take off more than anyone else, but I did my thing & I was there at a certain time before alot of other people, so...I've had that acknowledgment from some other people & it doesn't piss me off, I mean, I wish it could have been a little different, but we made our mark. Joe Holmes was a member of Lizzy Borden & he's also known for his work with David Lee Roth and he toured as fill in guitarist for Zakk Wylde with Ozzy Osbourne. On May 17, 2004, guitarist Alex Nelson was killed in a head-on car collision. In 2006 Lizzy Borden released "Appointment with Death" and the cd features guest appearances by George Lynch (Dokken), Dave Meniketti (Y&T), and Corey Beaulieu (Trivium). On Jan 24, 2009, former guitarist Corey James died in a car accident. Drummer Joey Scott is singer Lizzy Borden's brother & those 2 are the bands only original members. Rock N Roll Experience: Is there still a big demand for Lizzy Borden around the world? Lizzy Borden: South America has always wanted us, but we've never played there for whatever reason & so we actually contacted other promoters & they all wanted it so we started booking right away & we never really did that before because we always concentrated on our markets where we sold records. But, now, that doesn't mean anything anymore, so we can play markets where we don't care about sales, but for the most part we always concentrated on Europe or the States, especially the States, but now there is a younger fan base in Europe, so we are really paying attention to Europe because that's the future for a band like us...it's definitely the future...they've all of a sudden turned on to us & we're having a great time touring over there & this is our 2nd tour & we go there every year for the festivals as well. It's hard to play the States, it was hard to book this tour, to try & make it happen...we tried to go out with a few bands & make a big package, but no one was ready to do that quite yet....we've done it a few times, but with this tour we just decided to go ahead & do our show & have a good time. The set list that was taped to the stage was slightly different than what the band played this particular night...I saw "Born To Be Wild" listed in the encore but the band didn't play it...instead, the encore was switched up a bit & Lizzy declared, "This song is dedicated to the man on the silver mountain!" & he said it was for Ronnie James Dio, then they ripped into "Long Live Rock N Roll" which was actually already in the bands set before the passing of Ronnie James Dio. I'll admit that I had no real expectations for this show...I remembered Lizzy Borden as a frizzy haired guy who played late 80's styled heavy metal; I checked out recent youtube clips & what made me curious about this show was that he was still doing a very theatrical show; there were costume changes, fake blood, knives, axes, & what I saw online looked like Alice Cooper in a small club....to be honest with you, that's the EXACT way I'll describe this concert! Rock N Roll Experience: Playing the large festival shows, do you ever have other bands coming up to you & admitting they are fans of Lizzy Borden? Lizzy Borden: Lordi said they were huge fans, he admitted that pretty much every song he ever wrote was just a rip off of "Me Against The World" (laughs), I didn't mean rip off....it's a tribute...Lordi is a great guy, we might actually write some songs together...we are thinking Me, Him & Udo because he is good friends with Udo & Udo wants to do it too because all 3 of us are kinda known for anthems, so we are going to try & write a couple o' anthems together see what happens. Rock N Roll Experience: That would actually be pretty cool, it's kinda like the 3 Metal Tenors! Lizzy came out after 11 PM in a black out mask, wearing an all black Halloween styled robe & it was clear that ALL of his stage props were things you'd buy at Halloween time; the axe, the knife, the masks, the robes, the skeleton gloves...I loved it all, it was fun, it was a little campy at times, but it's something you don't see everyday in a small club show...an actual SHOW! Lizzy mixed up the set with both new & old favorites; "American Metal" sounded new & fresh, surprisingly & the backing band really bring to life all the old classics. I won't lie, "Me Against the World" was the song I wanted to see the band play, it's my personal favorite & the backing band played it as if they'd wrote it! I can't stress enough, even with a crappy sound mix this particular night, Lizzy Borden & his band were amazing, the dueling guitars were very old school ala The Scorpions, Judas Priest & Iron Maiden & the rhythm section were flawless as well. The stage was actually a little too small so the Lizzy Borden banners that adorn both sides of the stage via PVC pipe were altered...no lie, the Lizzy banner on stage left was literally duct taped to the ceiling & the Lizzy banner on stage right kept falling over from time to time when Lizzy would go behind it for a costume change. Rock N Roll Experience: I've got to ask, since you're all about the theatrics & show, what do you think of Lady Gaga? Lizzy Borden: I love her! I'm blown away by her skill & her talent & her songwriting ability...that's why she is so big, she's got the skill, she's not just a lip syncing pop queen....she actually writes great songs that are influenced by Elton John & Queen & all these great singers & great songwriters. You can see where that all comes from & that's where anyone who ever inspires to write songs should kinda do, look at who came before them & say, "How can I do that in my own way?" & she (Lady Gaga) did it. When I heard her on the radio for the first time I thought, Whoever this is, this is good & then you hear some of the other stuff she's done on her record, not just the pop stuff, & you go, wow, there's something here! Rock N Roll Experience: Would you ever collaborate with Lady Gaga? Lizzy Borden: In a heart beat! Hell Yeah! I haven't done too much collaboration, even just talking to Lordi about doing that, it's kinda like, ok, how do you wanna do this? (laughs) You write the chorus, I write the verse? We don't really know because we both write our owns songs from beginning till end, so it's like, ok, you write this piece & I'll write this piece, but yeah, I would definitely work with Lady Gaga...absolutely! Seeing Lizzy preform a fake laceration on his arm complete with fake dripping blood, seeing Lizzy come out as a demon that bites into a blonde bimbo's shoulder, complete with gobs & gobs of dripping blood; seeing Lizzy serenade a skull head ala King Diamond & "Abigail" them, midway through the skull serenade Lizzy had a stage hand come out with a cup of fake blood & Lizzy baptized the ENTIRE front row with the fake blood....literally, most of the people on the floor rushed to the stage front & allowed Lizzy to swipe fake blood all over their faces....it was like a broke assed version of the movie "Carrie" in many ways...kinda funny, kinda cool & entertaining as hell! Rock N Roll Experience: Do you keep in touch with any of the former Lizzy Borden band members? Lizzy Borden: I know Mike Davis is just about ready to go out with Halford, my old bass player, & he's doing the Ozzfest with them & I'm excited to see that, I haven't talked to him in a while but we will be talking, & I don't really talk to any of the other guys...I haven't seen them in a long time. Rock N Roll Experience: I know that 2 of the guys from the old Lizzy Borden band passed away too. Lizzy Borden: The Master of Disguise line up, Alex Nelson & Corey James & they both passed away in the same sorta car, a Ford Explorer, like 5 years apart, it's insane, but we have a drink to them almost every night so it's like they will always be remembered. Often times a highly theatrical band will lose points because they place more emphasis on the "show" rather than the music...I hate to call them out, but KISS did that at times...don't get me wrong, I'm a big KISS fan, I like their music, but at times it felt like they were more concerned with a big show than quality music....even Alice Cooper started to release some "iffy" stuff after a while; it's hard to maintain a balance of writing good music & still offering an entertaining show; trying to make it theatrical is an added challenge, but all in all, in 2010, Lizzy Borden does just that...the music they play might not be the flavor of the week here in the USA, BUT, it's good heavy metal, the players in the band are superb musicians, Lizzy's voice sounds strong & his presentation onstage is both fun & unique. 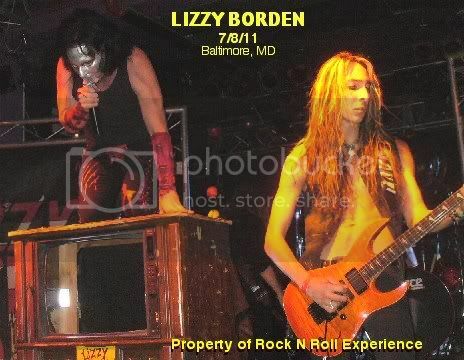 Lizzy Borden, the man, these days, is part Taime Downe, part Marilyn Manson, part Wednesday 13....I think Alice Cooper is CLEARLY the true originator of it all though, so my description of a Lizzy Borden 2010 show stands; it's like seeing Alice Cooper in a small club, theatrics & all!